Last night Michael performed at the first BBC 999 Awards which took place at the BBC Television Centre. The show’s aim was to acknowledge the heroic acts that officers and volunteers perform on a daily basis. 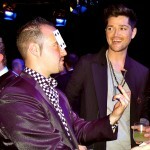 He’s seen here performing for Danny O’Donoghue of The Script. Check out the Gallery page for more photos!